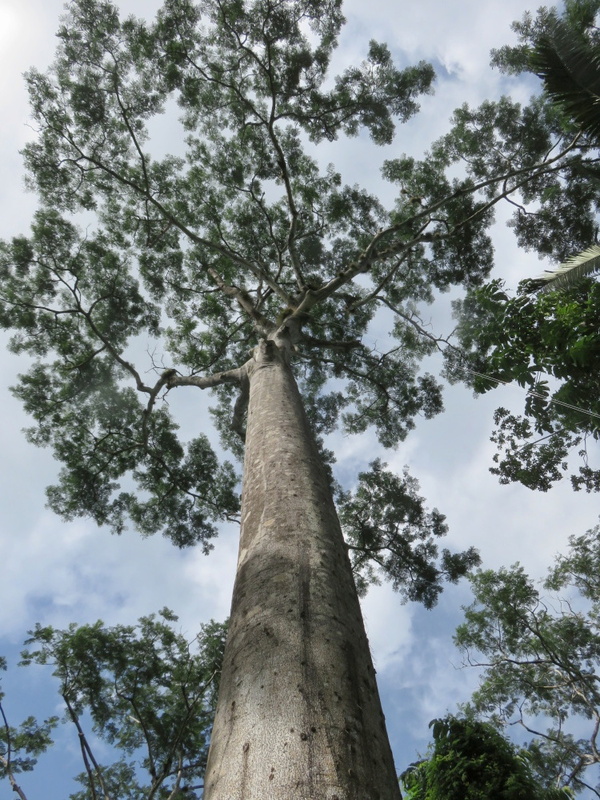 One of Belize’s, one of the world’s, most beautiful creatures is at risk for local extinction. 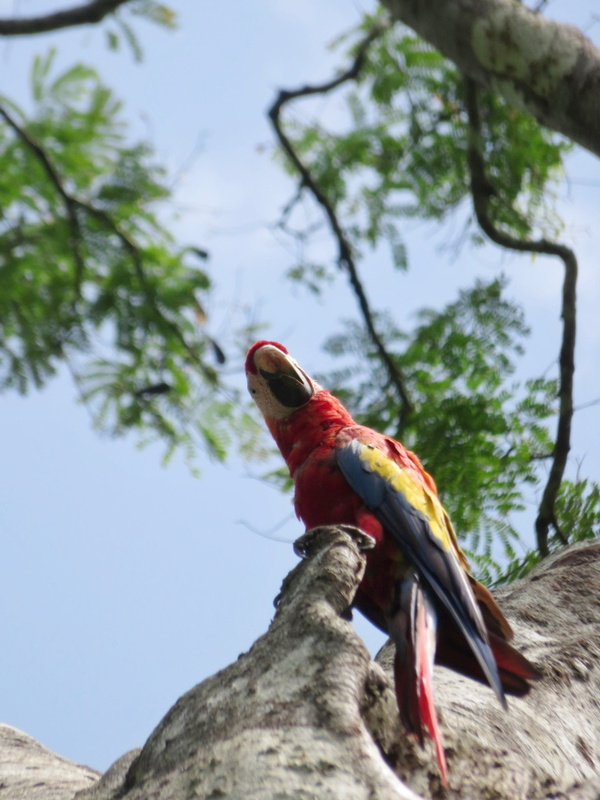 The gorgeous and almost surreal scarlet macaw – few, even Belizeans, have seen it flying wild. 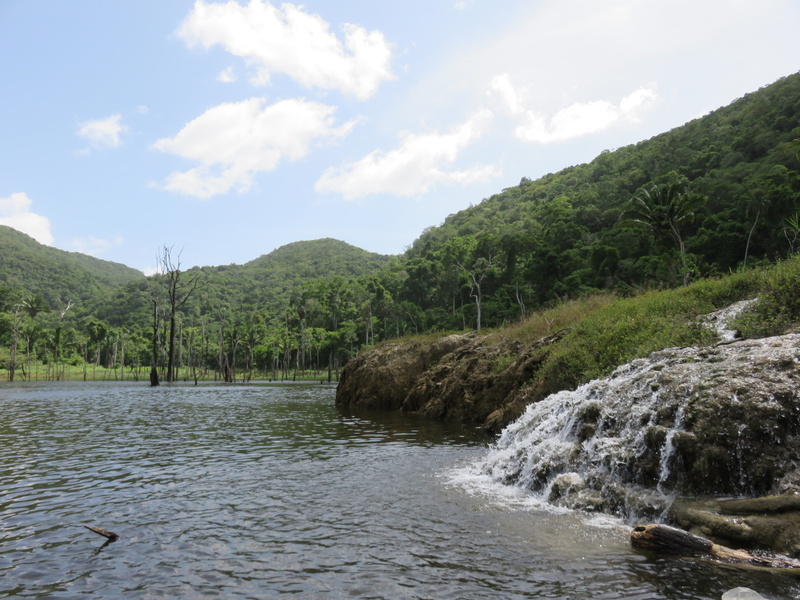 And due to heavy poaching and habitat destruction (one of the birds’ native nesting grounds, the Chalillo Valley was flooded when a dam system was built in the early 2000s), the numbers in Belize are ridiculously low. They are described as endangered in Belize with less than 250 birds. And Mexico and Guatemala are seeing the same problem and similar numbers. POACHERS. 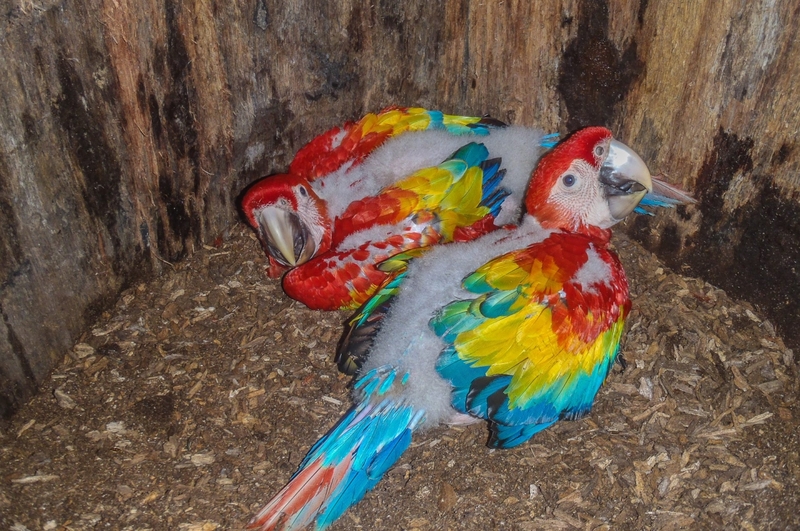 In 2011, it was estimated that 89% of nests in the Chiquibul Forest (pronounced Chicky-bull) were poached. Most by Guatemalan poachers locally called Xateros (Sha-tear-os) who can sell the babies for hundreds or even thousands of dollar. 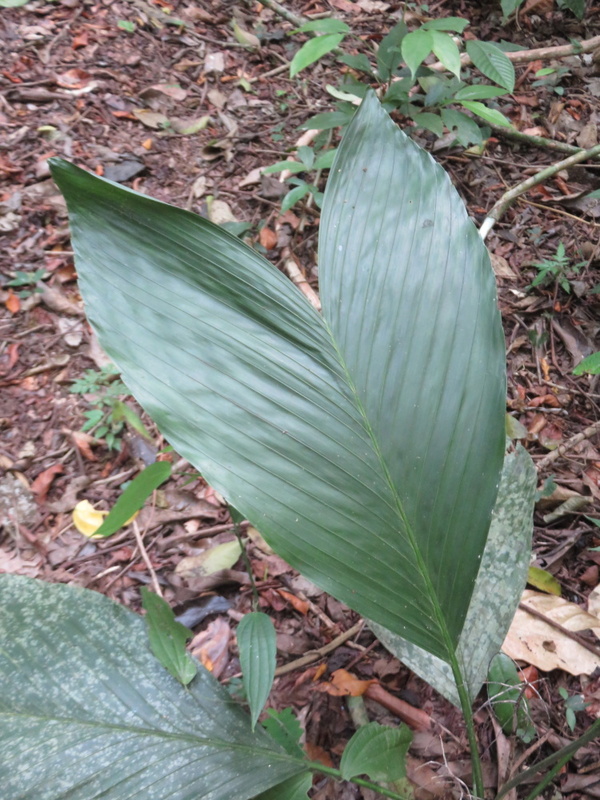 Named after a plant that is also poached from Belize’s jungle – the xate (sha-tay). A PLANT used for flower arrangements! 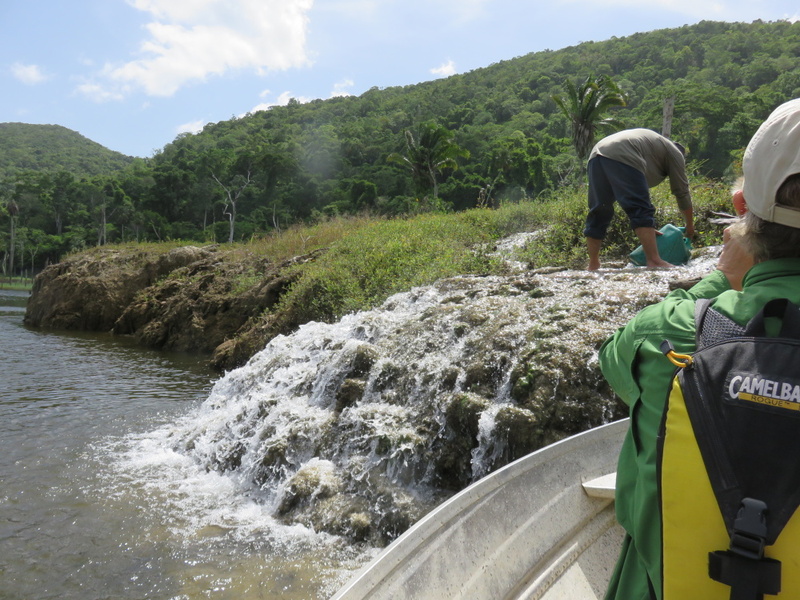 Since then the FCD (Friends for Conservation and Development) – have made patrolling the area a much larger priority. Especially since 19 year old Tourism Police Officer Danny Conoroquie was shot and killed by Xateros in 2014. 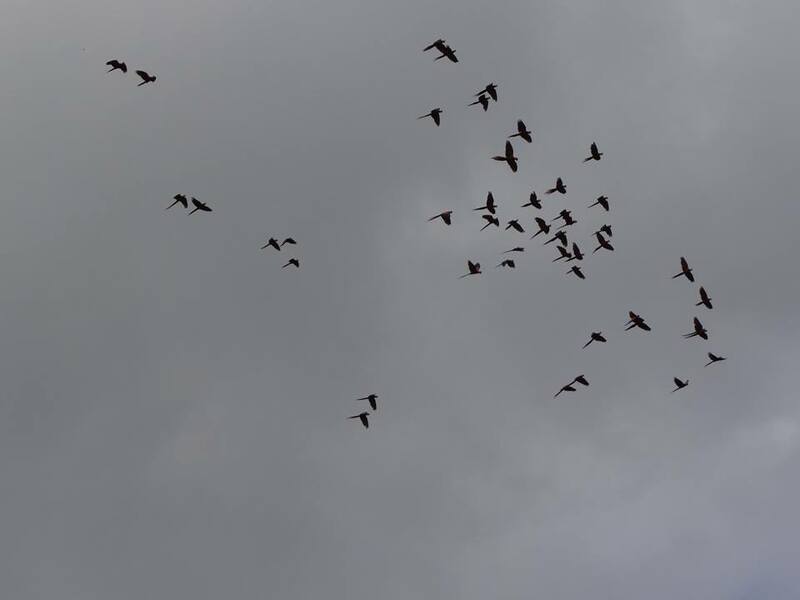 It has been the amazing Scarlet Six Biomonitoring Team (scrapping by with some grants and donations and volunteers) working to identify nests and then set up camps from Mid-April to August or September to protect the chicks and their parents. 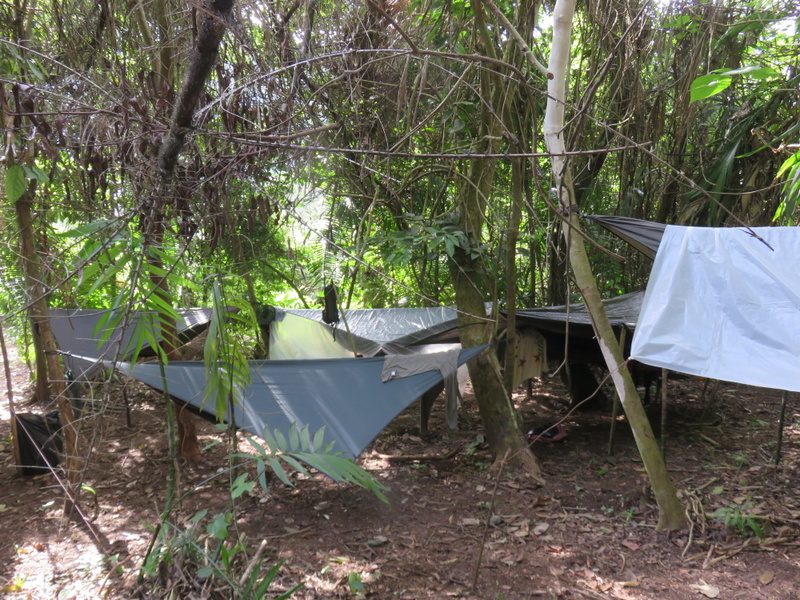 They guard the baby macaws from poachers by traveling to and then camping in the heart of Belize’s most untouched jungle. It is ABSOLUTELY AMAZING. 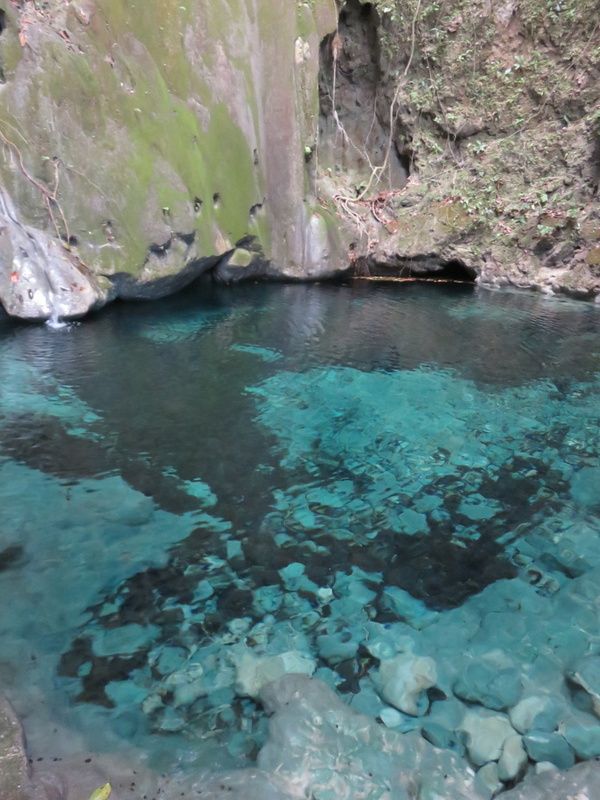 And over the weekend, I traveled with them and overnighted in the Chiquibul to see how they are doing it. Let me just get to the pictures. But before I start…this was one of the most amazing experiences of my life. Look at me. Yes ridiculous! But I really hate bugs. 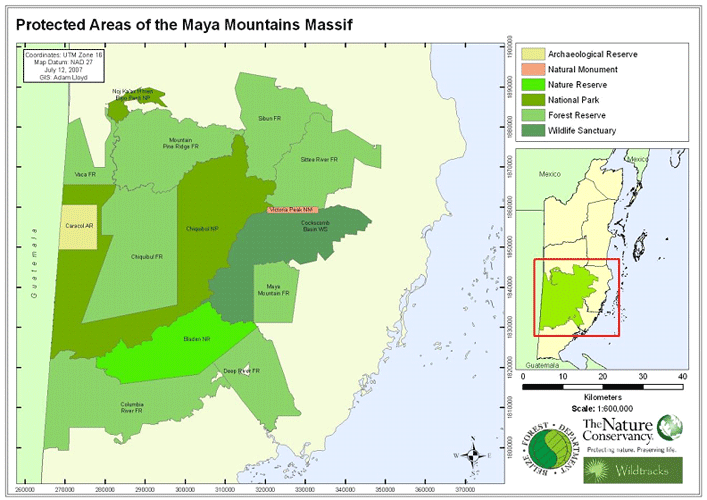 Here is a photo of the broader forest – over 600 square miles of “protected” land. 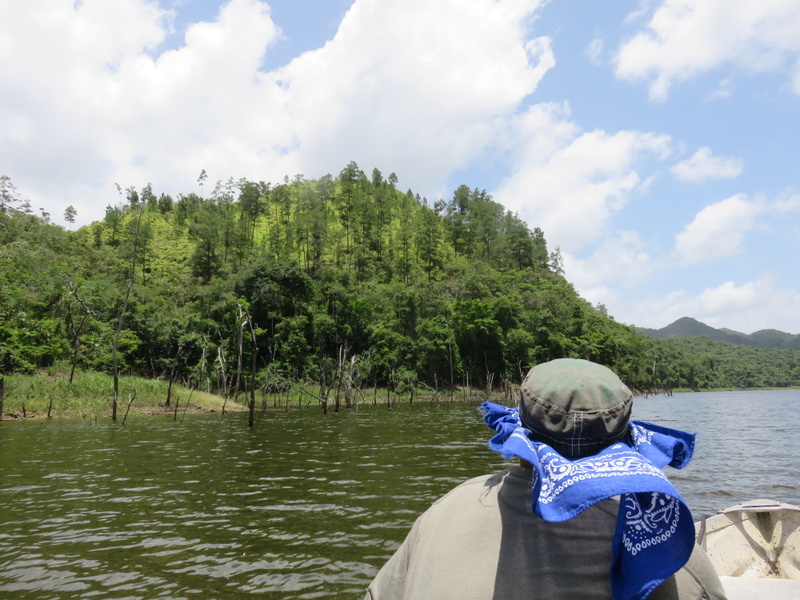 I put the marks around the word protected because every day Guatemalan cross the border to poach plants, animals, artifacts and trees…it’s an area too big to monitor with such a small crew. 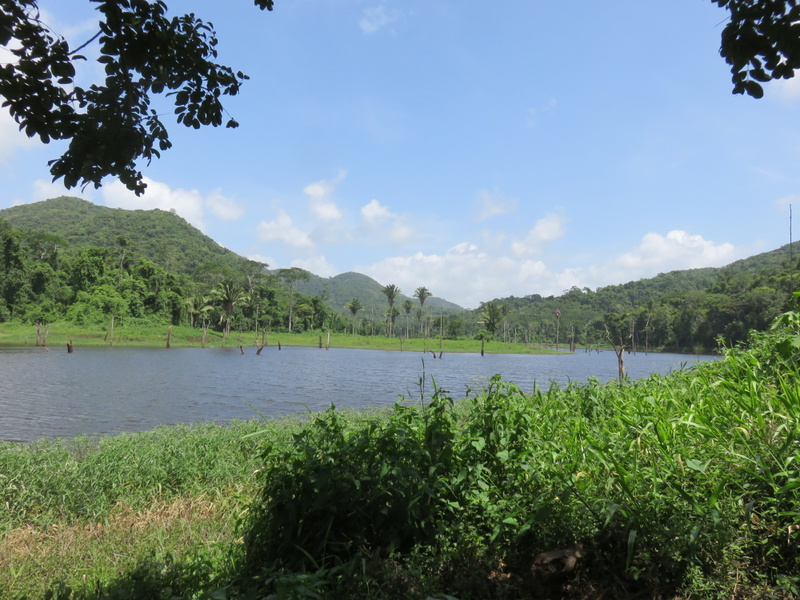 Here it is…now a lagoon – flooded by the Chalillo Dam built (under much protest) in 2005. 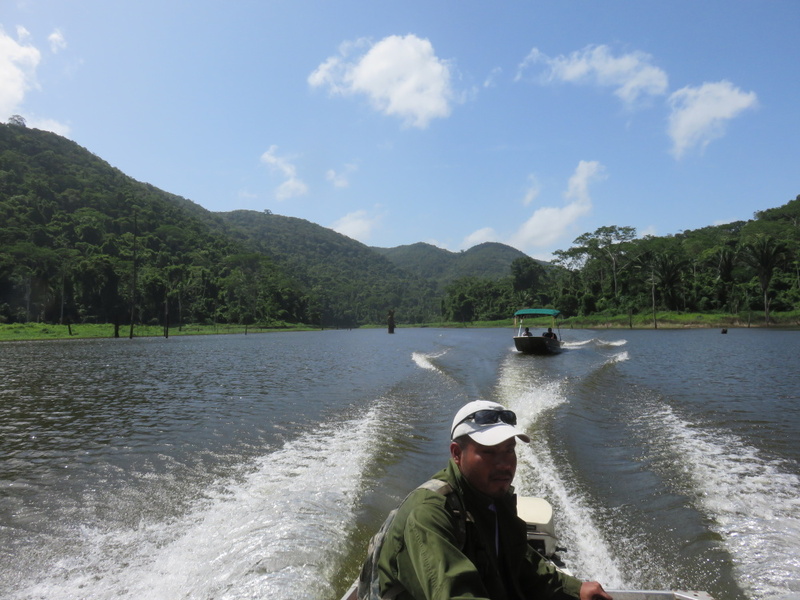 Isael, another S6 ranger, met us in a small aluminum boat. 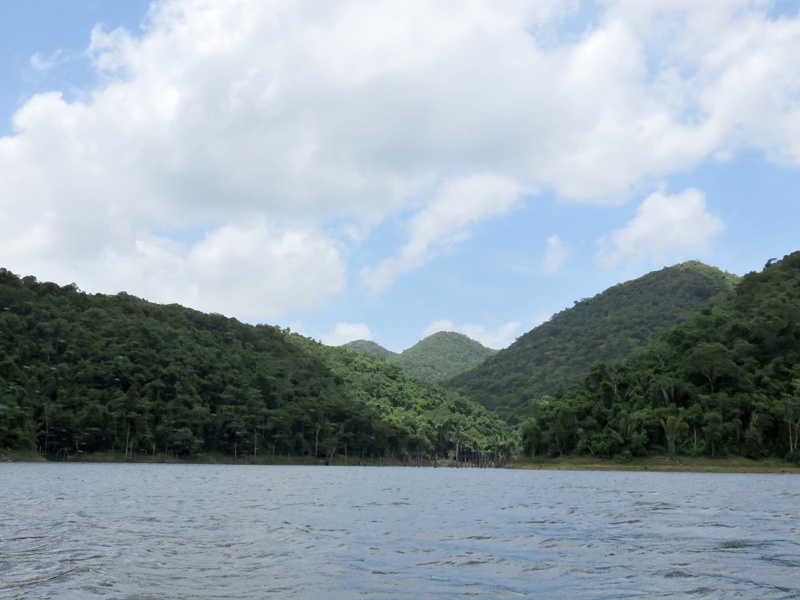 We’d be headed about 45 minutes up river…to the Raspaculo River…a favorite spot for the macaws. 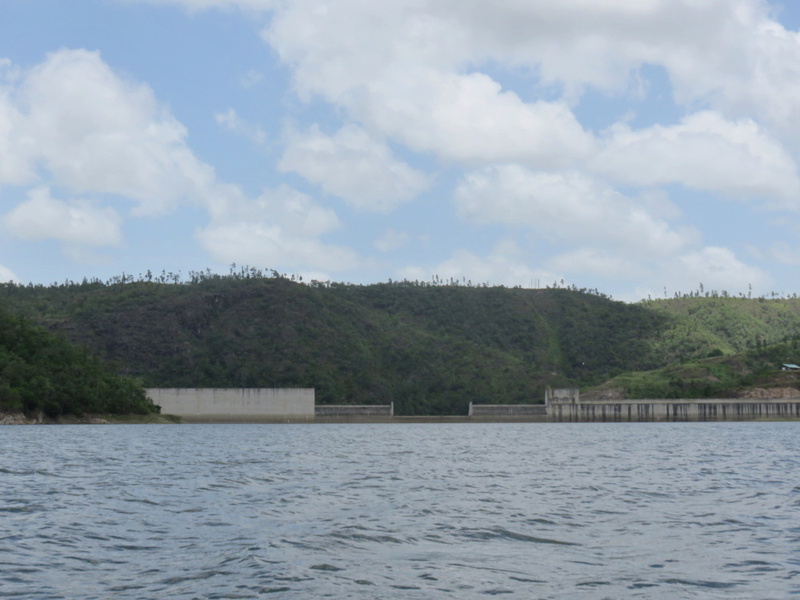 We first boated in the other direction to take a look at the controversial dam. Remarkably unremarkable looking. 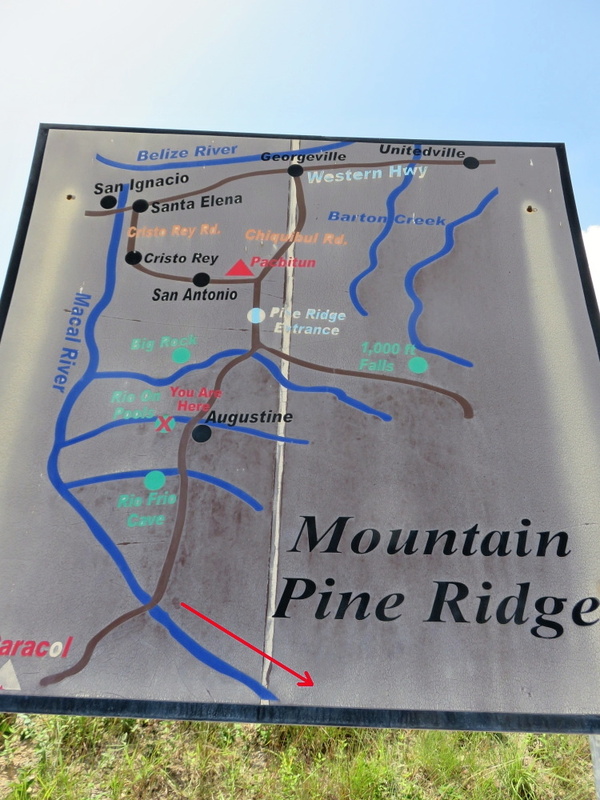 But it flooded the valley in 2005 and displaced many animals and their native breeding grounds. It’s just gorgeous out here. 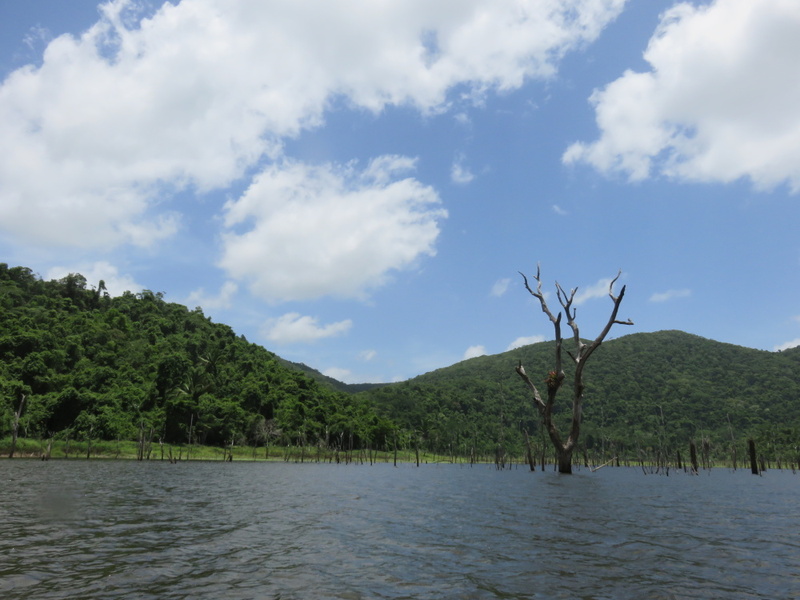 Completely untouched…apart from the dam. We chugged along. Pine forest (growing from acidic sandy limestone soil) to the left, broad leaf jungle (rich granite based soil) to the right. Nest #18. Our reason for being there? To protect their chick from poachers. 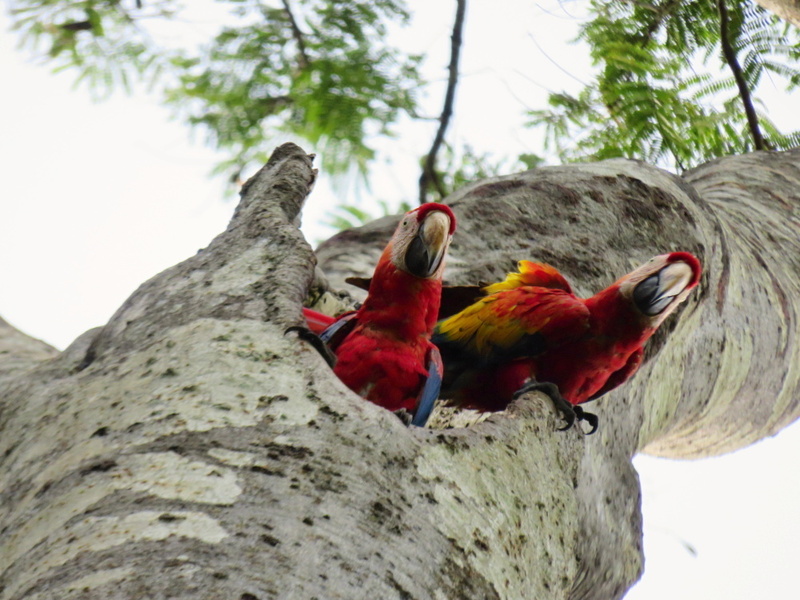 It struck me immediately: The scarlet macaw doesn’t do much to protect its species. It is loud and almost gaudy. 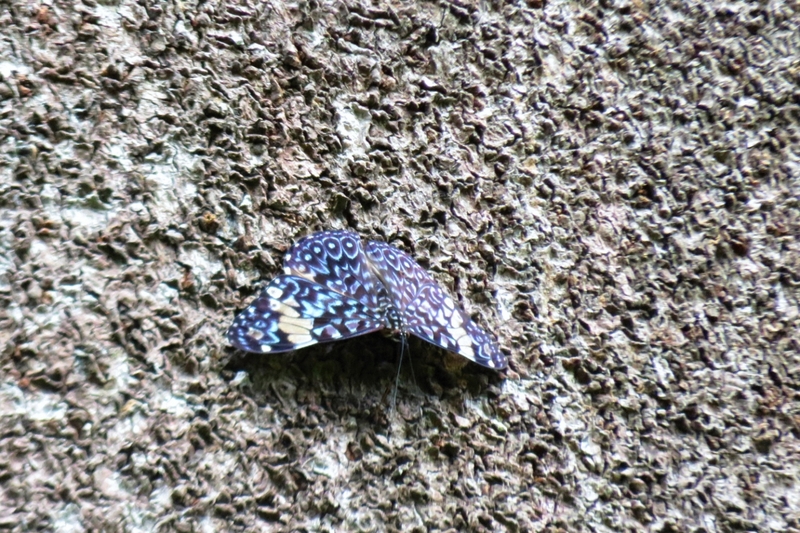 They nest solely in Quamwood trees that grow right along the river. They lay one or two eggs a year. They use the same nesting holes year after year and when they hear the boat or any noise, they peep their bright red heads out of the nest. Watching them come out of the hole is…like looking at a painting or a cartoon. They SCREAM for attention…literally and figuratively. But why would they look for protection? Go deeper into the jungle? They have lived out here in the untamed wilderness for years – feeding on the nuts of the quamwood, soaring high over the river…and poaching is a relatively new thing. I immediately went over to get a closer look. And they were equally curious. Our first task? To set up my hammock/sleeping quarters. Testing it out for the first time. Really comfortable. There were 6 of us in all. More than usual. But I was just along for one night – the usual “tour of duty” is 10-12 days. 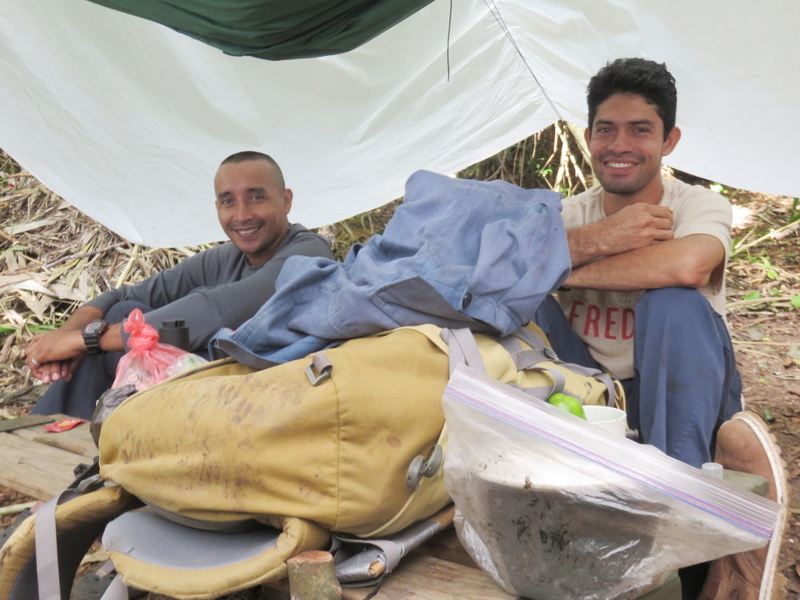 Chico and Justo, two guides from Ian Anderson’s Cave Branch, had arrived the afternoon before. 16 of Ian Anderson’s guides are volunteering over the next month to protect the chicks with the S6. And then the view across the river. We were there to “be a presence”. To guard the chicks. NOT ON MY WATCH. The rangers from the FCD are armed (and they would be stopping by)…the Scarlet Six are not. After setting up a bit and unpacking my granola bars and cookies, we went to collect fresh water. 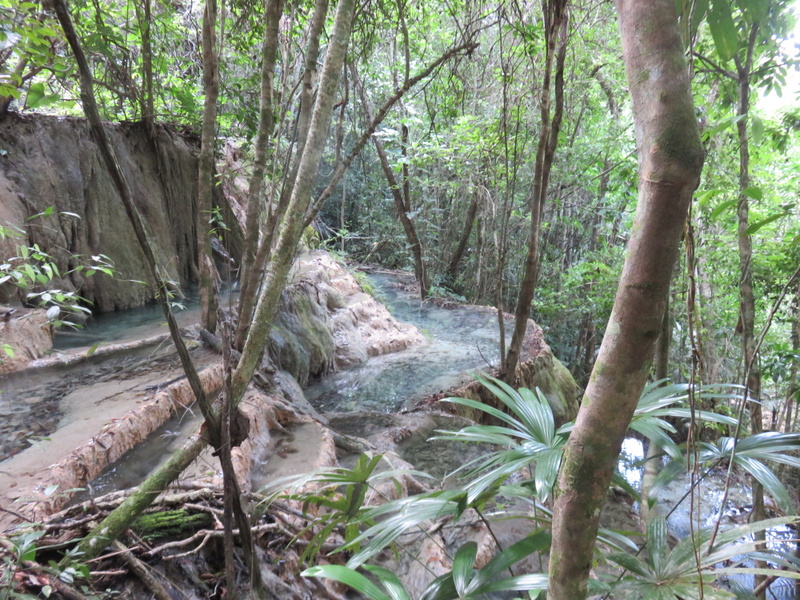 A small fresh water stream trickling from the jungle into the river. BEAUTIFUL. We spotted this guy. 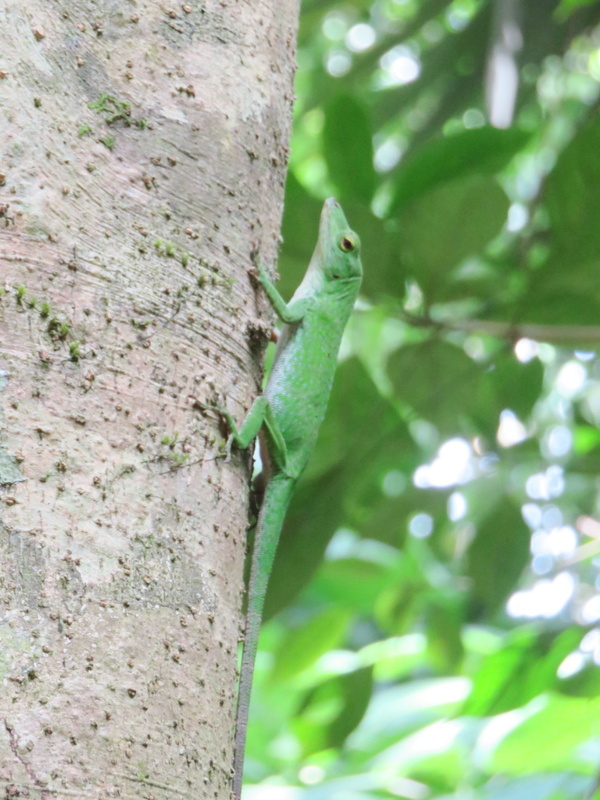 An anole. …and a steep wall and at the bottom this. I did not alter a thing in this picture. The guys told me of how they ran into Xateros here last year…and quietly snuck away. Saftey first. 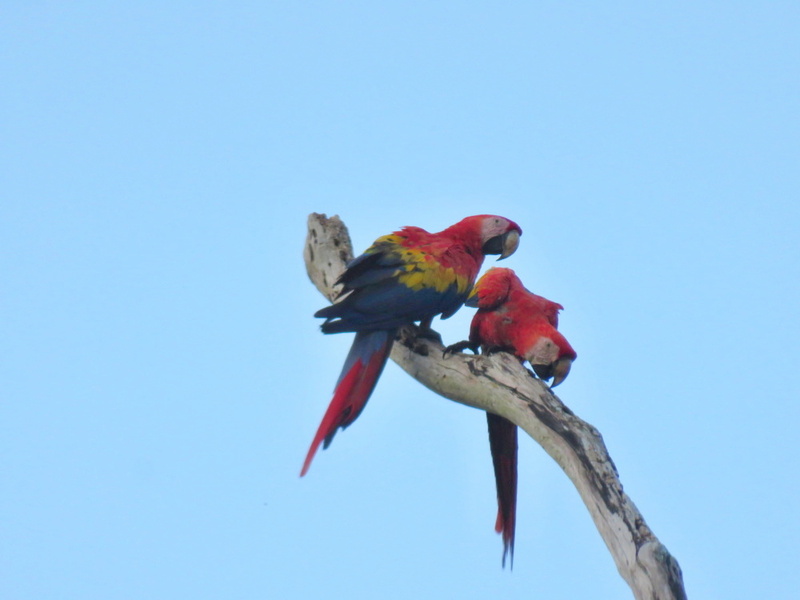 Our couple was preening in a nearby branch. Keeping a close eye on their nest hole. 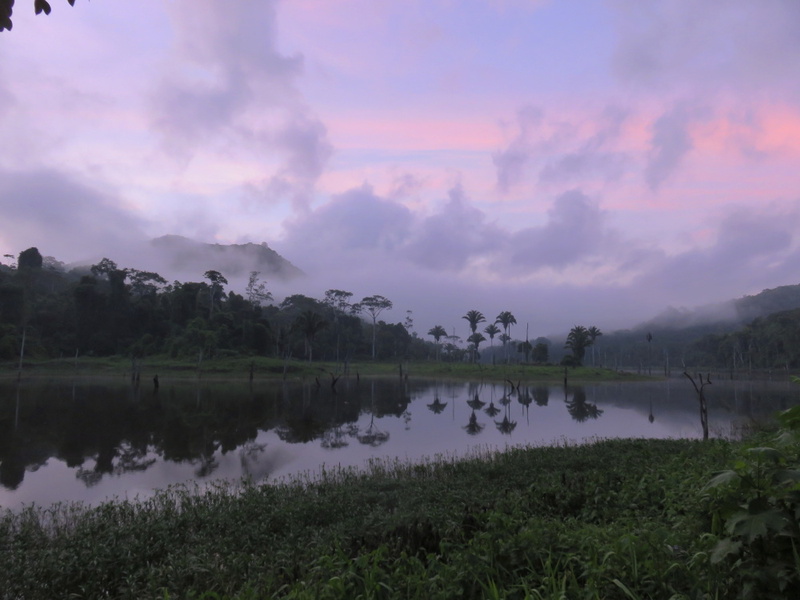 I sat by the river while the sun set behind the camp…but the view was absolutely gorgeous. And when darkness fell, the cicadas awoke and hundreds of toads stood on our paths. 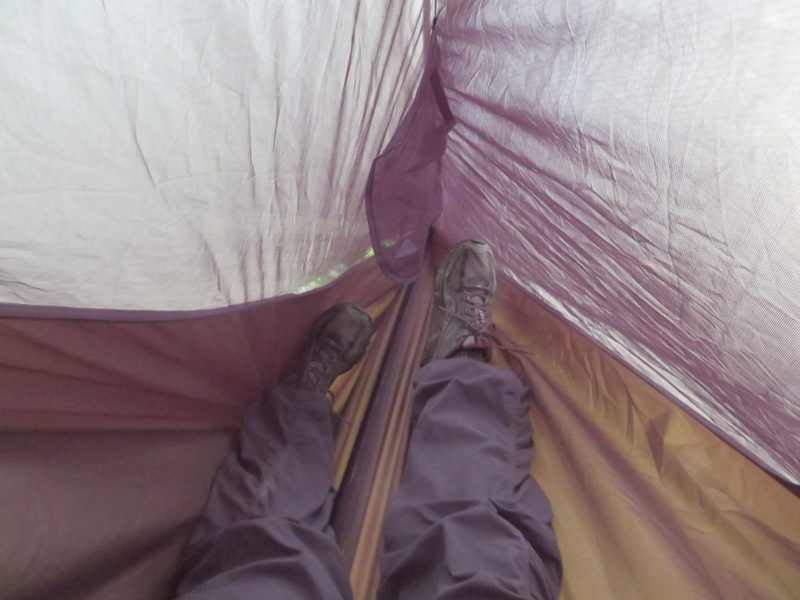 I slept in my clothes, in my hammock and still the mosquitoes found me. 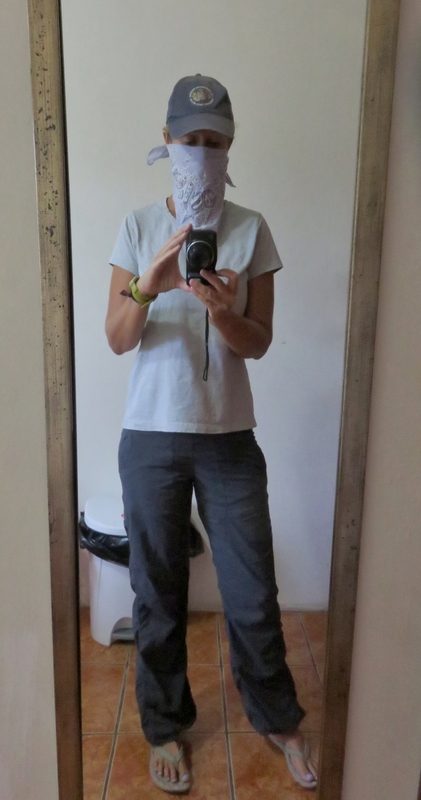 And note for my next trip, it gets CHILLY in the Chiquibul. Dawn. And fog drifting over the mountains. 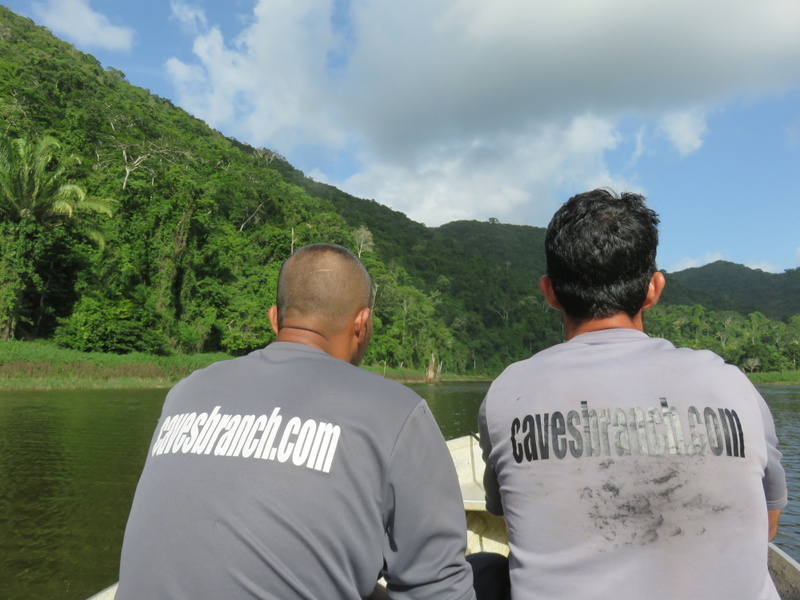 I headed upriver with Luis to visit the next camp of volunteers and S6 rangers. More volunteers from Ian Anderson’s…and his wife, Ella, were at the camp. 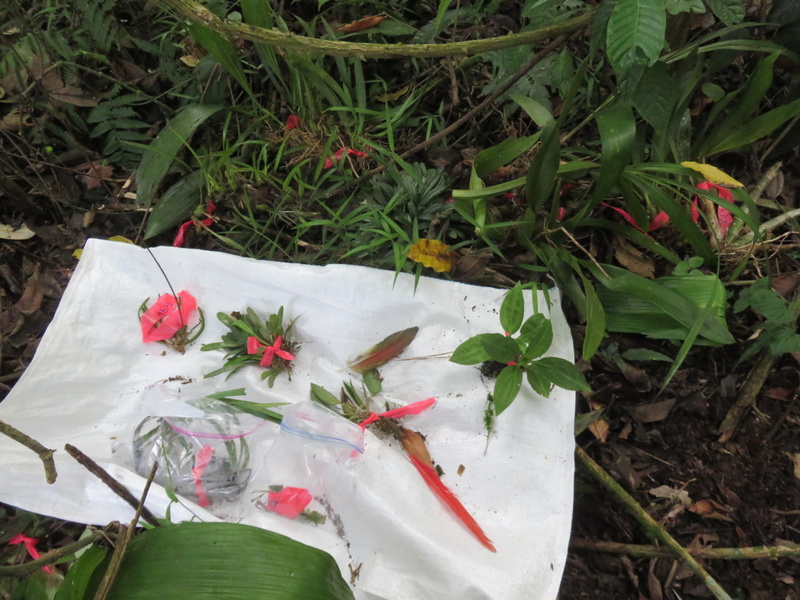 She works to collect and identify orchid species for scientific work (she does not keep them). And she had found an amazing assortment. Including this one. 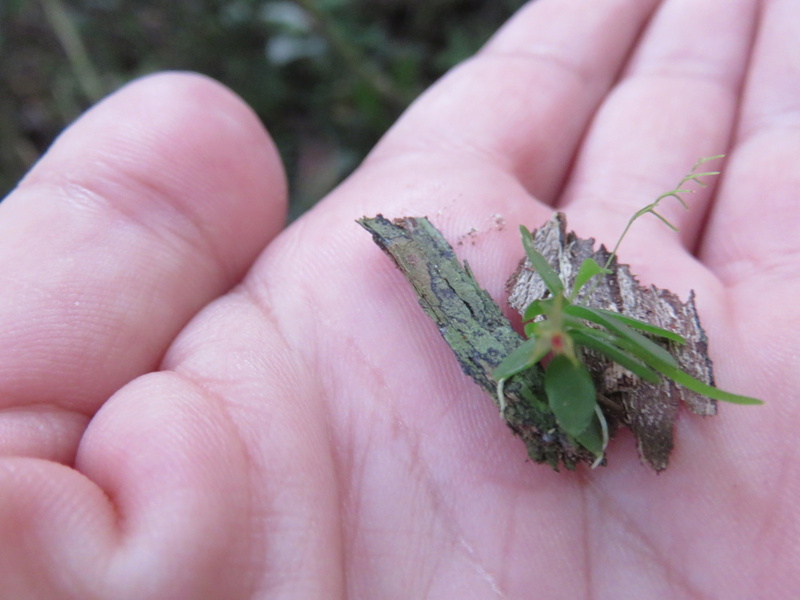 With the tiniest flower I have ever seen. They were protecting 2 chicks high above in this qualmwood. 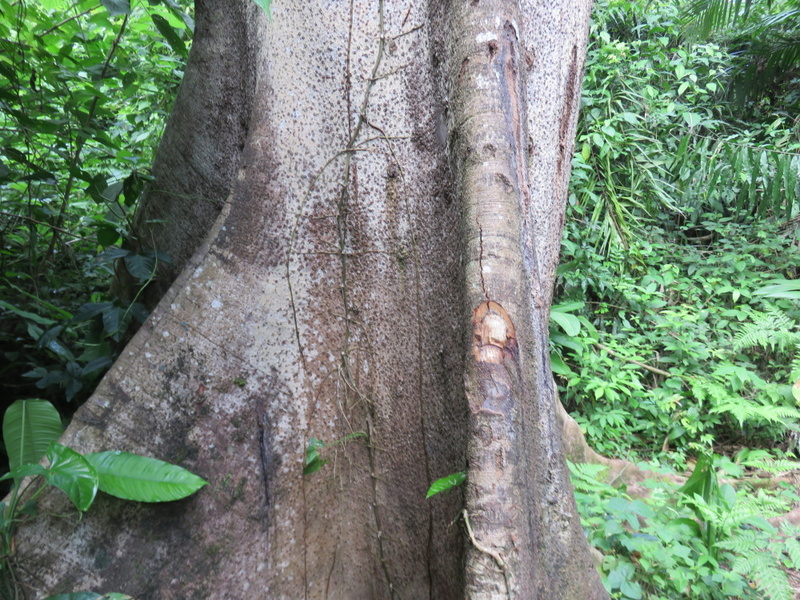 This tree showed marks from earlier in the year when poachers climbed the tree (with spiked boots) and found only eggs. They marked the tree to return. But then the Scarlet Six set up camp. NOT ON OUR WATCH. We headed back with the FCD just behind us – there were going to climb our tree and take the weekly photo of the chick. To see how he/she is doing and to estimate when she will fledge. 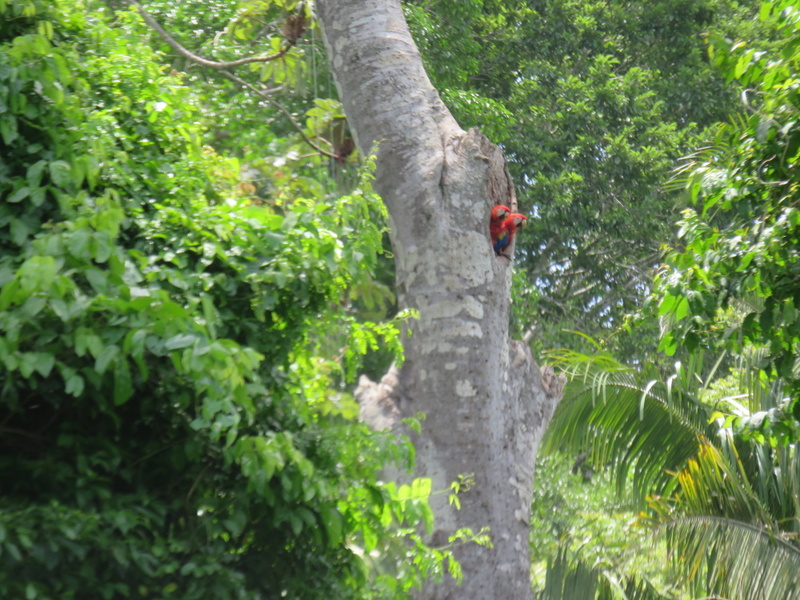 One of the parents watched as the ranger geared up for the climb. 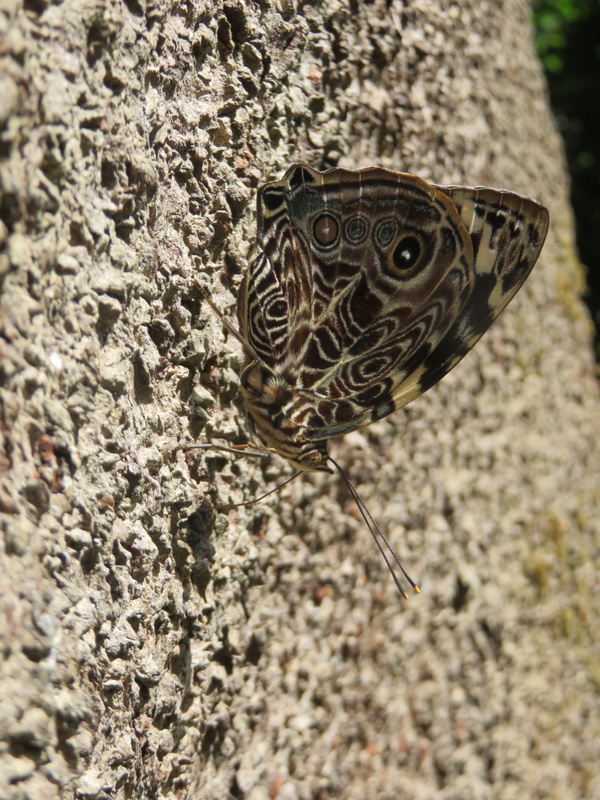 Butterflies love these qualmwoods too. I must have seen 20 different types on this trip. To photograph our chick. Healthy. And ready to fledge in mid-August. Here is a recent picture of a nest with two ready to fledge soon. ABSOLUTELY AMAZING. This year the team estimates it will save 15 chicks. 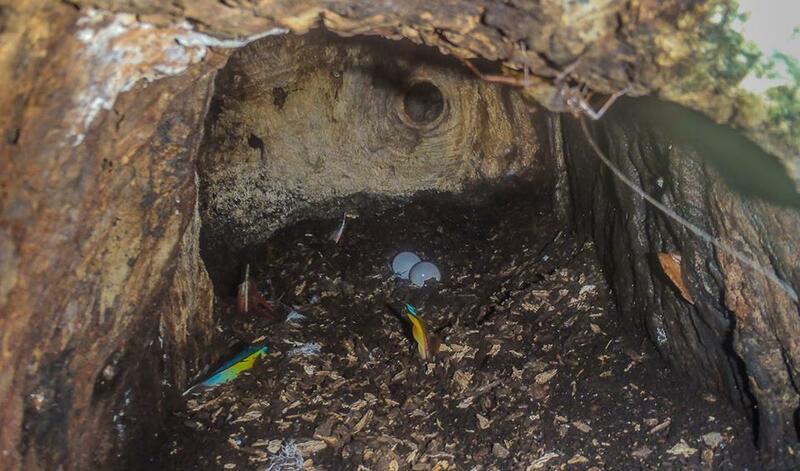 8 have been removed from nests that cannot be watched. They will be raised in the Chiquibul but by humans and then released. IDEALLY all the nests identified can by under surveillance by the team so that their parents can raise them and increase their chance for survival. 15 chicks may not seem like many…but we are talking a total population of 125 pairs…maybe 150. Each chick counts. 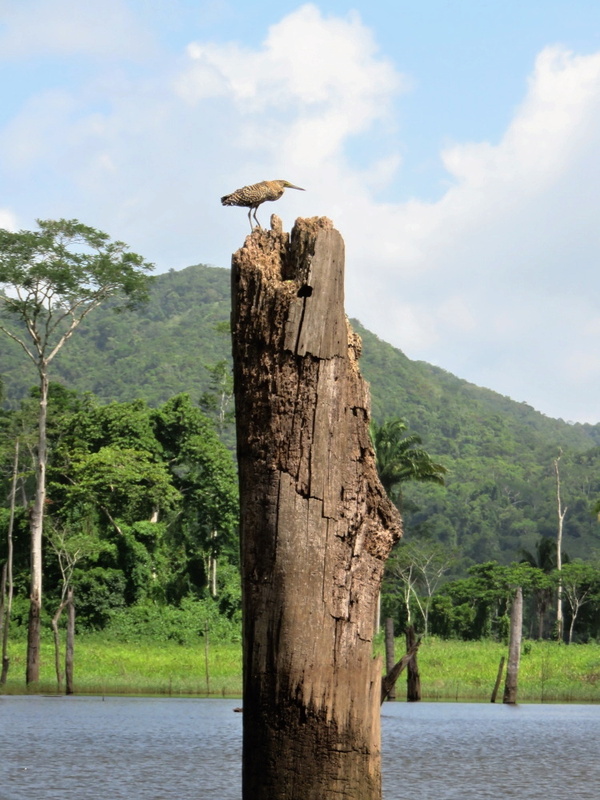 I know you are asking HOW CAN I HELP save these gorgeous birds…so that they remain in Belize, for Belizeans? I have copied and pasted this from a pamphlet that is used by the team. * Spread the word. Tell your friends about Scarlet Six and encourage them to find us on Facebook and Twitter. We post regular updates throughout the year and especially as the season progresses. * Volunteer with us. 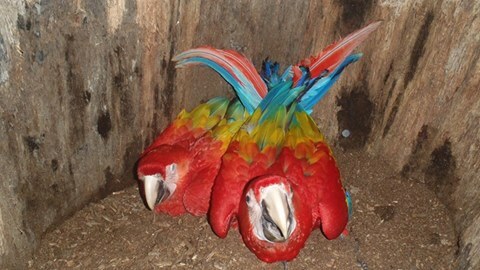 We are always in need of more volunteers in the field to protect Scarlet Macaw nests from poachers. 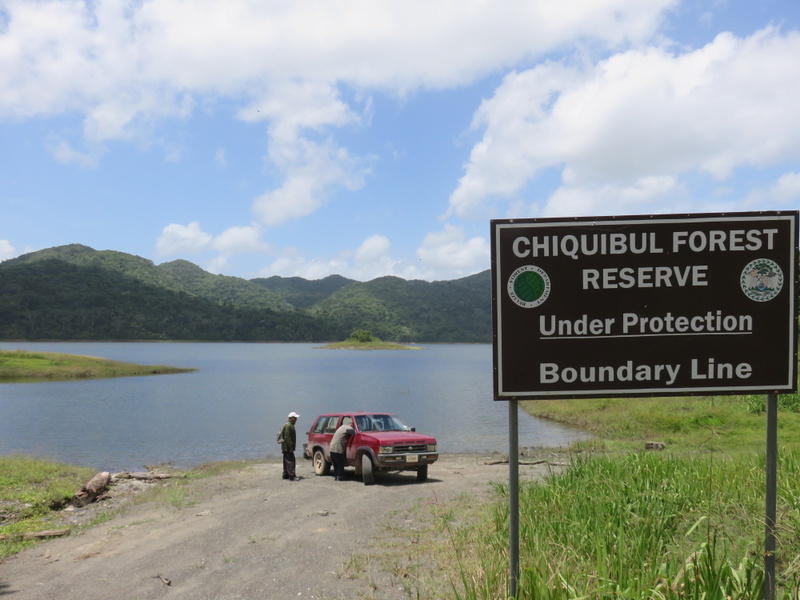 The more volunteers we have, the more area we can protect in the Chiquibul Forest. Rainforest Restoration Foundation 9307 S. Evanston PL, Tulsa OK 74137. There is also a direct GOFUNDME page for the Scarlet Six team specifically for the fuel costs – the truck & boats rides to the camp sites. My trip was amazing. Jaw dropping amazing. I saw so many birds…from orioles to kingfishers to this gorgeous tiger heron. 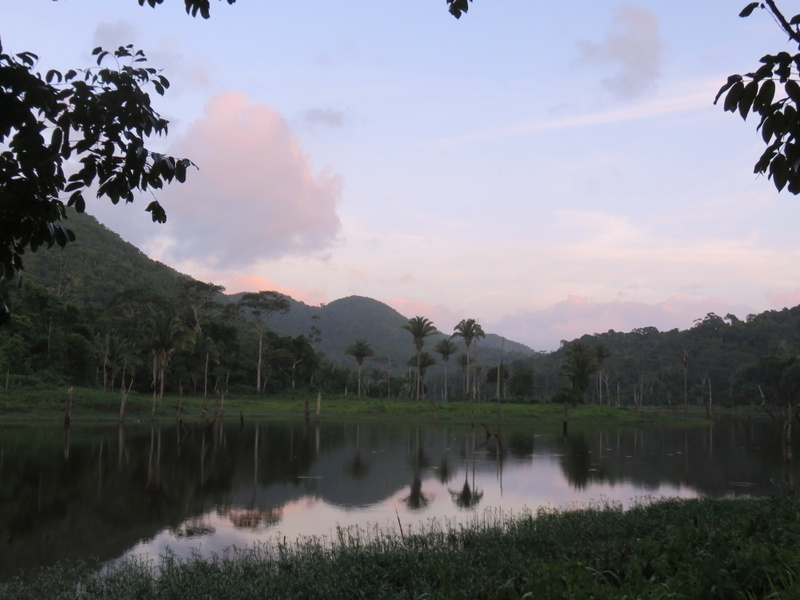 We all saw macaws galore soaring over the river and peeping from their nests. If you are a bird watcher, you should be signing up IMMEDIATELY for this post. It is un-freaking-believable. Did I get bug bites? Yes. Right through my pants and hammock…is it possible that I am now the host for a botfly? Uh huh. Am I still finding mini-ticks on my legs. Yes I am. And am I thinking about going back on doing this again in September for 12 days? Hell yes. The team had some eggs just recently laid…some late bloomers. And they need protection. The Scarlet Six is paid solely by donations. Luis and Isael are on duty until all the chicks fledge (leave the nest)…Luis then goes back to farming peanuts and corn in his village of San Antonio. 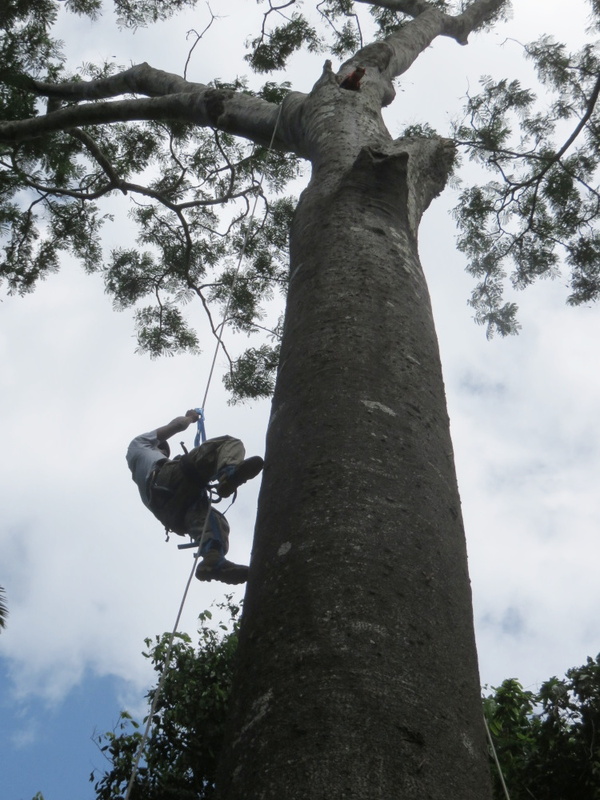 Isael works the rest of the year at the Belize Raptor Research Institute. This is a labor of love. And not an easy one. Just camped out for 4 months keeping watch for one or two chicks. Some might think they are crazy, I think they are heroes. All Belizeans should have a chance to see this. Spectacular even on an overcast day. I’ll say it again – ABSOLUTELY AMAZING. Sitting here on my couch in San Pedro, two days later? It seems like a dream. 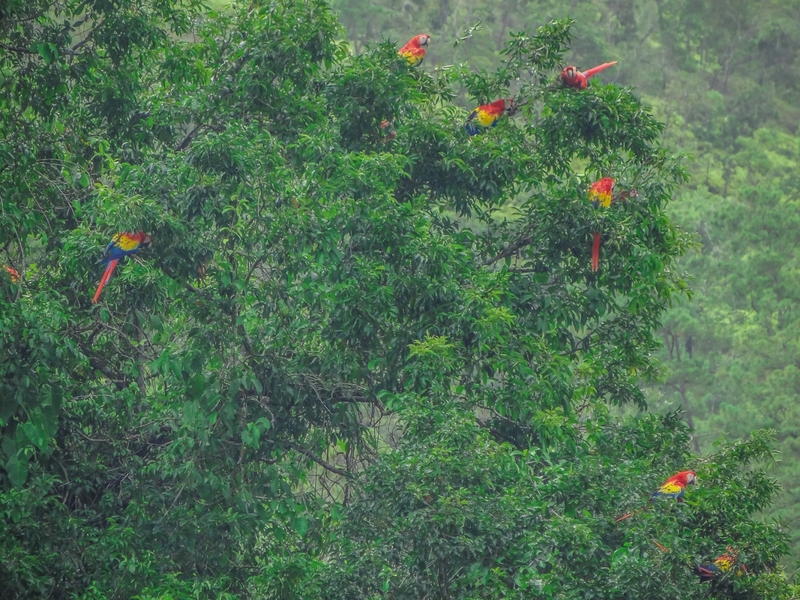 If you are interested in the fight against the damming over the river, read The Last Flight of the Scarlet Macaw: One Woman’s Fight to Save the World’s Most Beautiful Bird. 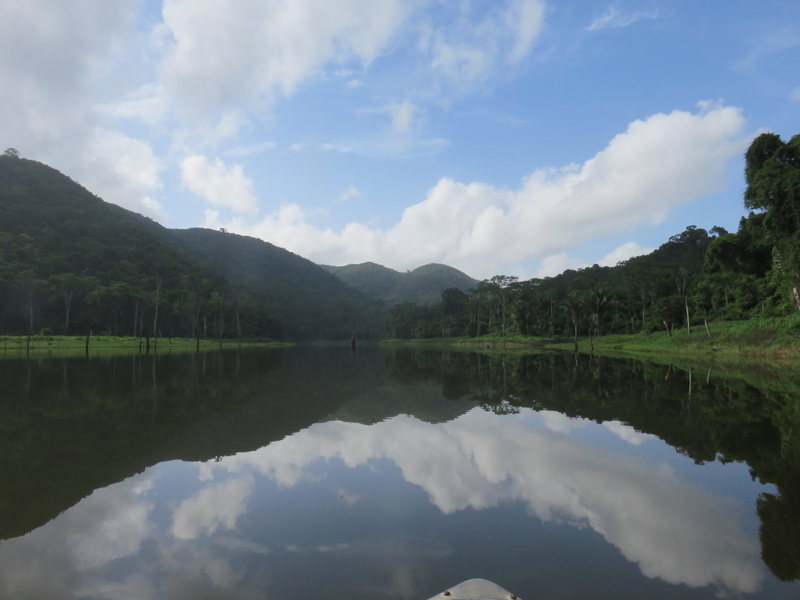 A great read if you love Belize. To share this story on Pinterest, please PIN below. Best post ever! Long, detailed, and great photos. Long is right. That area just GIVES great photos…unspeakably beautiful. Thank you for all YOU DO. What a wonderful post. You just keep getting better and better. Thank you! Thank you. Certainly one of MY more adventurous ones. I am crazy lucky to meet some incredible people. These rangers are extra-ordinary. Fabulous write up. Amazing dedication of the Scarlet six who are doing things the right way. Go baby Macaws! Go Bernie! What a brave and selfless sacrifice for the volunteers and the Scarlet 6 team. I’ll match your donation and counter with one to Dr. Carson! I donated last year and will certainly donate again! What a fantastic group of volunteers! So glad you are posting articles like this! Good job as always! Simply amazing! I wish I could get ALL the pictures to load (ah, Mexican internet), but I will be rooting hard for the Scarlet 6! Thank you for highlighting this important cause. Great, great work. HOPING you do not have a botfly, though…ugh! I….ya. Me too! But seeing some poeple with them out there…it really doesn’t seem all that bad. Are you trying to tell me Mex internet is worse than Belize?!?! Heheh, no not at all. I think our download speed is around 6 Mbps, though upload is sluggish. But for some reason I am having problems with this one post — have tried it a few different times. Still, I did get to see most of the photos and loved them. I couldn’t do his last .september due to my arthritis, Rebecca. But now I have a new Titanium hip! Wanna do it with me next summer?